Iraq war veteran Chuck Gregg was back home with his family last winter when he got bronchitis. His doctor prescribed Ketek, a relatively new antibiotic, CBS News chief investigative correspondent Armen Keteyian reports. Five days later, Gregg was in the hospital with liver failure. "They run their battery of tests, and they come back and it's definitely what's called 'drug induced' or 'pharmaceutically induced hepatitis," Gregg explains. "He survived 13 months in Iraq, you know, all over Iraq, to come home for this," adds Sherry, his wife. Iraq War veteran Chuck Gregg and his wife Sherry describe how his health failed after taking the antibiotic Ketek. 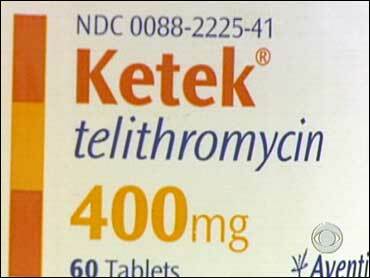 The FDA has continuously updated warnings of Ketek's possible side effects, including "signs ... of liver problems." Gregg says because he had no previous liver problems, he had no reason to be concerned. Now he's pointing a finger at the FDA. "Based upon the data available to me, I believe this drug is far more dangerous than other drugs that fight the same infections," says Dr. David Ross. In an exclusive interview with CBS News, Ross, who reviewed Ketek's safety for the FDA, says he warned his superiors that the drug was, in his words, a "time bomb," and was shocked last summer when the acting head of the agency, Dr. Andrew Von Eschenbach, told employees to keep concerns about the drug in-house — and out of the press. "He said, 'If you don't follow the team, if you don't do what you're supposed to do, the first time you'll be spoken to, the second time you'll be benched, and the third time, you'll be traded,'" Ross says. Instead, Ross says, he quit the FDA in disgust. "The leaders of an agency should not be holding a meeting to suggest dissenters should be kicked off the team," says Sen. Charles Grassley. "Particularly when the life of American people are at stake." Sen. Grassley today issued a scathing report criticizing the FDA's oversight of Ketek. CBS News has learned there is a new Congressional probe under way to determine whether Ketek should remain on the market. The manufacturer says Ketek is safe to use. Von Eschenbach declined to speak with CBS News, citing a FDA meeting about Ketek beginning tomorrow.